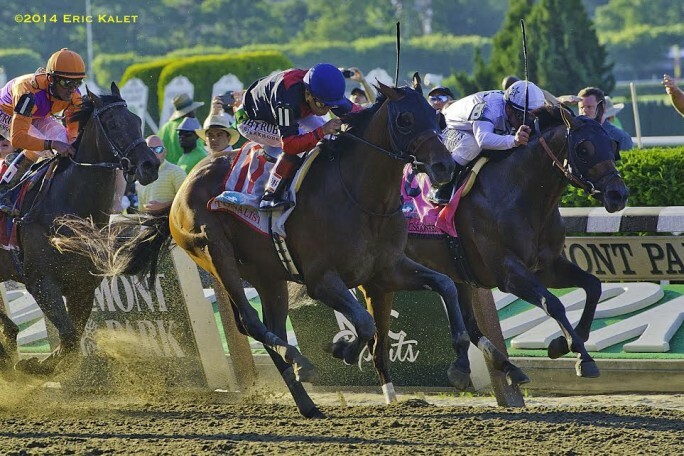 Tonalist, Joel Rosario up, won the Belmont Stakes today. Sadly, California Chrome was not able to pull off a Triple Crown win at today’s Belmont Stakes. Looking tired, he finished fourth in a dead heat with Wicked Strong. The win went to Tonalist — who ran a good race and fought for the win. Many of us were hoping to see another Triple Crown victory, after witnessing three in the 70s, but there’s a reason why only 11 horses have pulled this feat off since 1919. Instead, he will be added to the list of 21 other horses who managed to win both the Kentucky Derby and the Preakness but who lost the Belmont. Why did Chrome lose? Reports are coming in that he caught a quarter — which would have left him hurting. In which case, maybe fourth wasn’t such a bad result. Perhaps coming four wide around the final turn wasn’t the best path. Maybe he was just too tired. Or perhaps it’s a statement about current breeding trends. Co-owner Steve Coburn, had a bit of a rant after the race (goaded on by the commentator and obviously in the throes of disappointment). His point was that it wasn’t fair for horses to come into the Belmont fresh when the Triple Crown contender had to run three big stakes races in five weeks — especially given that the longest race is last. Looking at opinions of fans in the press, many people agree with Coburn. But there has never been a requirement for a horse to run in all three races . . . or even that a horse needed to have enough points to run in the Derby. Should the rules be modified? I’m not so sure. Tonalist wouldn’t have been able to run. Although he won the Peter Pan stakes, he was unable to make his Grade 1 start and qualify for the Derby because his intended stakes debut in the G1 Wood Memorial at Aqueduct was aborted when he worked poorly and was found to be sick. Should that have kept him out of the other races? Certainly limiting the field to runners would level the playing field . . . but would it make it a true test of the best three year old horse of the season? The “Triple Crown” is an artifact created by the media — the idea of a triple crown of racing was first used to describe the British trio of “classic” races, the 2,000 Guineas, the Derby and the St. Leger Stakes, which was first won by a single horse (West Australian) in 1853. It was imported to the US as a way of increasing excitement for fans, rather than as a test for the horses. Each of the three races is important in its own right, and over the years, has almost disappeared. The first US Triple Crown winner was Sir Barton in 1919. When he won the three races they weren’t five weeks apart. In fact, the Preakness was run just four days after the Kentucky Derby. Some years the Preakness was the first of the three races and other years the Derby and the Preakness were the same day, making a Triple Crown winner an impossibility. It wasn’t until about 1950, when Cartier was commissioned to make the Trophy, that the concept became more official. I am sorry that California Chrome fell short. But I’m also sorry that so much of the attention after the race was aimed at him, and that the winner of the Belmont, Tonalist, his jockey Joel Rosario, his trainer Christophe Clement, and his owner Robert S. Evans didn’t get the credit they deserved. As for California Chrome, he came back safely. Who is to say that his career won’t move onto other strengths and his quality will shine through. Having won the two of the three Triple Crown races he’s in good company. No one disputes the lasting quality of such horses as Man O’War, Northern Dancer, Nashua, Riva Ridge, Swale, Spectacular Bid, Alysheba, Silver Charm, and Real Quiet. What do you think? Should the Triple Crown rules be changed? Did this impact California Chrome’s Belmont? Great post! I was very disappointed in Coburn’s rant (and rudeness toward his wife) and I think you hit the nail on the head. Many owners (even the owner of the great Man o’ War) have voiced the concern that May is too soon for three year olds to be running a long distance in a race like the Kentucky Derby. You are right–the Triple Crown wasn’t created or set up as a series, it was a title eventually bestowed upon the winner of three separate, difficult races–races that each have their own histories and challenges. Triple Crown winners (and losers) have run against large fields, small fields, horses that ran in all three races and horses that didn’t. I’m deeply concerned that if the rules change to the way Coburn wants them to be, we risk more horses being pushed to the point of catastrophically breaking down. Why? More horses would be entered into the Derby that aren’t yet physically ready simply because it would be a prerequisite so that they would then qualify to race in the Preakness and Belmont. That is a HORRIBLE idea. The tracks are faster than ever. Veterinary care and equine nutrition are better than ever. We need to rethink how these horses are being bred and trained. Improve breeding to improve musculoskeletal integrity–stop running 1000+ lb horses on immature toothpick legs. I would also love to see starting age bumped at least a year. No two year old should be pounding down a track. Start racing them at three and save the Triple Crown races for their four-year-old year. I agree with “ingallsra” and love Liz’s whole article. I still love Chrome and think it’s okay his owner shared his views, even if people don’t agree with him or how he said them. It’s a privilege we have in this country. Yesterday Espinoza tweeted well wishes to California Chrome and attached a photo of the bloody gouge that was a result of his race injury. It looked ugly and made me think about the heart he and all those other Thoroughbreds have. I saw on Twitter, but can’t prove the veracity, that Chrome will run in The Breeder’s Cup. As much as I hate crowds and LA traffic, I think I need to find a way to make it this year. It’s literally down the street from where I work. As a horseman, I was disappointed in California Chrome’s owner. Good sportsmanship requires us to be gracious losers. Its easy to be excited about a win, but in horse racing it’s never a given. We had a horse that ran 2nd on Saturday and I was thrilled with the way the horse ran. She didn’t get the perfect ride, but she was wonderful to me. No one fowled California Chrome. He is a great horse and the distance at Belmont has been a challenge for many a great horse. To be disappointed in his performance doesn’t give the horse the credit he deserves. We all know that he is a front runner and this just wasn’t his race. Everyone knew the rules going into the three races. If they thought it was unfair, maybe they shouldn’t have entered their horse. I can’t even begin to express my disappointment in the way Chrome’s owner behaved. I was sorry that Art Sherman didn’t get the honor because he is a class act, but the whole Chrome crowd will go down in history as less desirable in my opinion. Too bad. A great horse with poor losers for owners. My mother’s old mare was grandfoal of Count Fleet, named Fleet Goddess. Sadly she has passed. I also went to Kind Ranch and met the man to back Assault over the weekend .